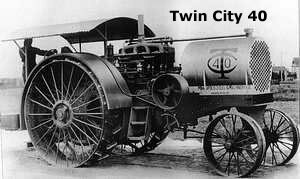 The famous prairie sod breakers and road builders started with the Twin City Forty in 1909. 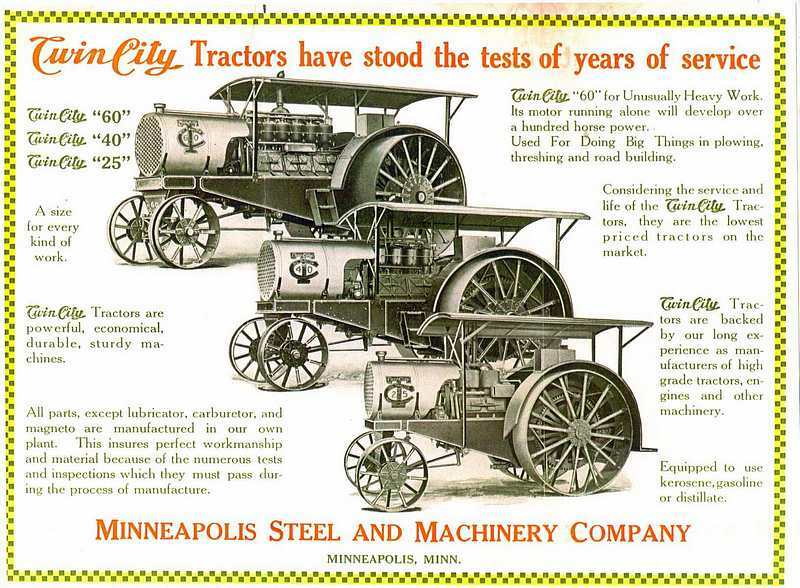 Working with McVicker engineering in Minneapolis five copies of this machine were made with a Minneapolis Steel & Machinery 7x10 engine, full canopy and operators cab. By 1913 the 40-65 type A was improved again with heavier sets of flat spoke wheels and a full canopy. In a final development the bore was increased to 7 3/4 and RPM moved to 535. With overhead valvetrain in place, this late unit became the type B. 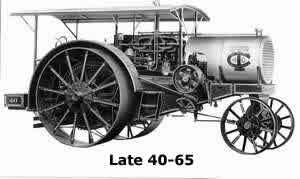 The smallest tractor in the heavyweight line was introduced in 1913 as a 15-30. Two forward gears were used along with two different engines. Early production used a tube radiator with a horizontal cross-mount TD engine. Within a short time an inline 4 3/4 x 7 TF engine running at 650 RPM was used and late versions incorporated an automotive cellular type of radiator. Weight was nearly 4 ton. 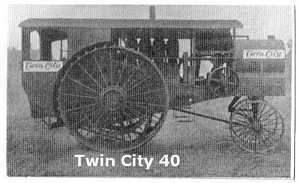 Twin City 15-30, 1913 - 1917 TD & TF serial # 5001 to 5478. Also introduced in 1913 was the 25- 45. Three styles of 6 x 8 engines running at 600 RPM accompanied two forward gears. Produced to 1920, the weight was nearly 8 ton. The biggest Twin City of all carries some confusion with it’s ratings and production dates. It may have been introduced between 1913 and 1915 as a 60-95 or 60-110. What is better known is that from 1916 to 1921 the 60-90 was produced. With one forward gear, a 7 1/4 x 9 six cylinder engine running at 500 rpm and a weight in excess of 14 ton, everything about this one hundred hp. Tractor was huge! 22 ft long, 10 ft wide and 10 ft tall, this giant machine cost over $6,000 when new. number of units is unknown. There are two original survivors today. * The 40-65 and 60-90 are believed to fall under these same sets of serial numbers.